The Hammerheads started their six day home stand off strong in Friday's 4-0 win. Seven different Jupiter batters recorded a hit in the victory including first baseman Lazaro Alonso, who had his first three hit game of the season and tacked on one RBI. Aaron Knapp, Luis Pintor, and Bryson Brigman all recorded an RBI a piece as well. Friday night's game was Brigman's debut in the Miami Marlins organization after being traded from Seattle in the Cameron Maybin deal. The newest Hammerhead scored one run and batted another in. Sandy Alcantara started on the mound in his third MLB rehab appearance for Jupiter. 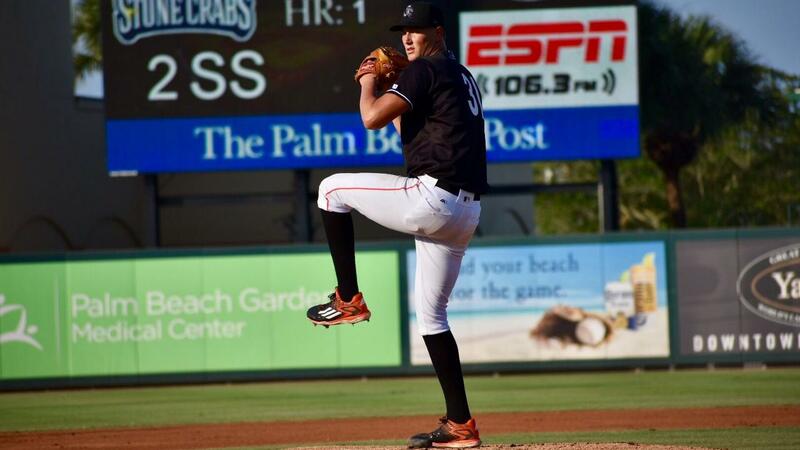 The Marlins number two prospect threw a scoreless 84 pitches in four 2/3 innings pitched, he allowed just two hits while striking out four batters. Out of the bullpen, Chad Smith came in the game in the bottom of the fifth inning to face one batter. Brady Puckett earned the save after pitching four scoreless innings, striking out three batters. This was the first save of the season for the 6'8" righty. Jupiter and Palm Beach face off once again Saturday night at 5:30 P.M. in Jupiter, FL. Tickets and more information can be found at Rogerdeanchevroletstadium.com/tickets-events.